The secret to landing a job interview is to make an outstanding first impression with your resume. 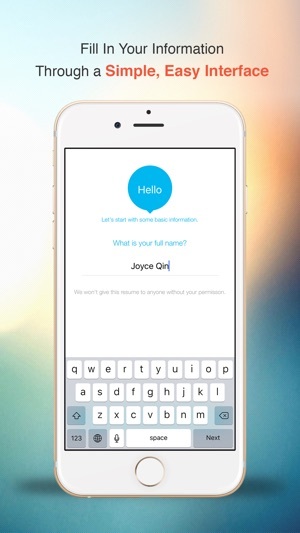 Leap out of the applicant pile with the most beautifully designed CVs on the App Store. Create the perfect resume for FREE even with zero design skills. Alternatively, you can pay a small additional fee and get access to our complete job search solution. • View great sample resumes for dozens of jobs, ranging from Software Engineer to Customer Service Rep, to get inspiration. 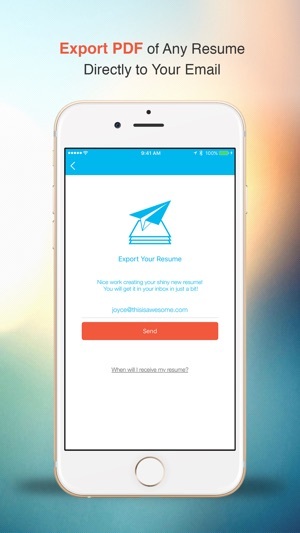 • Export resume directly to your email as a PDF for free. • Add, edit, and re-arrange resume sections easily. 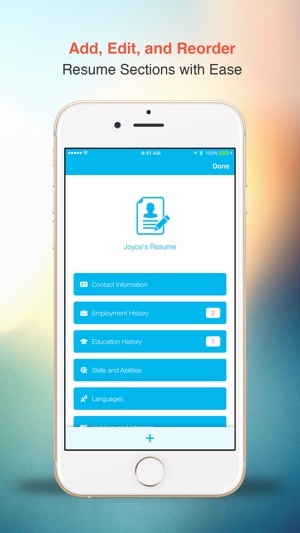 • Create and export an unlimited number of different resumes tailored to every kind of career. • Fill in relevant career and education information only once, then duplicate the resume to produce multiple variations. 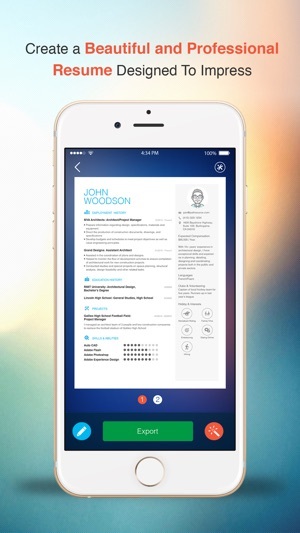 • Preview your resume at any point on your mobile device and apply any template to the preview. • Get a resume evaluation by a professional CV writer who checks your final resume for typos, errors, and inconsistencies. 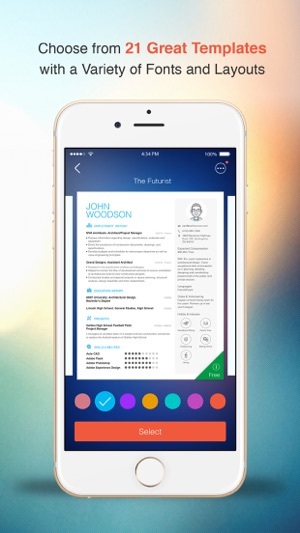 Why is this the only resume designer app you will ever need? • Free well-designed template, free PDF export feature, free sample resumes, and free sample language. • Get more - we offer a best-in-class job search solution for a low cost. • Easy to use, even for first-time CV creators. • Intuitive and fun user interface. • Tips and guidance along the way that teach you best practices for CV building. 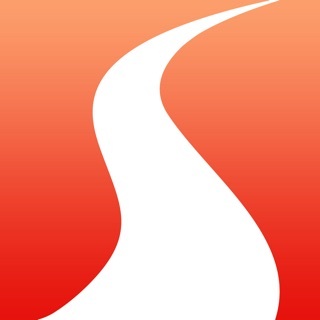 • Developed by the team that created the 5-star rated PathSource Career & Job Search app, which was featured by Apple as a “Best New App” and ranked the #1 career app on the App Store. Happy job search! I know our app will land you that interview. Thank you all for using our app, we pay attention to your feedback and are working hard to improve it. 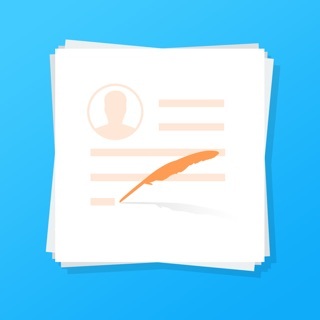 In this update we’ve added the most requested features - now you can export your resume, add references, cover letter, avatar, hobbies and interests for free! We also fixed some bugs and improved app loading time. All of the above, plus we’ve reduced the price for Pro Membership! Stay tuned, more exciting features are coming soon! NOT FREE OR CHEAP! They don’t tell you until the end either! I’ve been searching for a FREE RESUME BUIDER APP, and I thought I had found one. In some ways I guess I did but I was only able to create 1 (ONE) Resume and was only allowed to email it to myself 1 time (ONE) every 30 days, unless I purchased a template and paid for a subscription every month of like $12-$35!! When I only needed one resume until I needed to update it once I received a job. Well I had emailed it to myself because I am not allowed to save it to my phone or any other device, but I had left something out and went to go change it. Well they had a timer and I had to wait 30 days to do so! Unless of course I gave them my credit card and life savings lol just kidding, but it’s not cheap! I am doing this because I did not have a job and they obviously know that and still want me to pay you to change the spelling of my name or add a middle initial? That was just an example, but I have to wait another 30 days to email the second page of my resume and then another 30 days for the 3rd and final page. So it’s going to take me 90 days = 3 MONTHS TO HAVE A COMPLETE RESUME!!!!!!!!!!????? Not recommended if you ask me even though I do appreciate the one free page of my resume! This was horrible I went in expecting a simple resume builder hopefully with stylish designs to make you stand out as a candidate for whatever job you wish with LinkedIn support so that it could take everything from LinkedIn and organize it in a stylized format and what I got instead was questions I couldn't skip that was set up in a terrible format that were required to fill in and that couldn't be skipped so I could just edit the preview that I saw and even then I never got the preview I wanted to edit since it takes information and haphazardly throws it into the page. They could have done so much with this app I'm truly disappointed by the first time experience even LinkedIn has a better resume builder than this!!! That's when you know it's sad! So to fix it make an import button to import all the info and add skip buttons to everything that is irrelevant information because the way it is designed and bogged down makes it a nightmare to want to send into any employer. And I'm pretty lax so if I was an employer and I thought the result was a joke then that's saying everything. I really do hope this is improved the designs are great. Just really executed poorly. Actually a really cool app and free! I’ve read other reviews that you can only create one page so keep that in mind when creating your resume. Some features are blocked so you may have to use your head when adding certain categories in your resume and play around with the free categories only. Other than that you get 3 of the 12 templates for free so you do get to customize your resume and you can choose over 8 different colors for your resume! I thought it was pretty cool. Just don’t make any mistakes and review your resume because I also heard you only get to create one resume for free every 3 months. I recommend downloading this app!